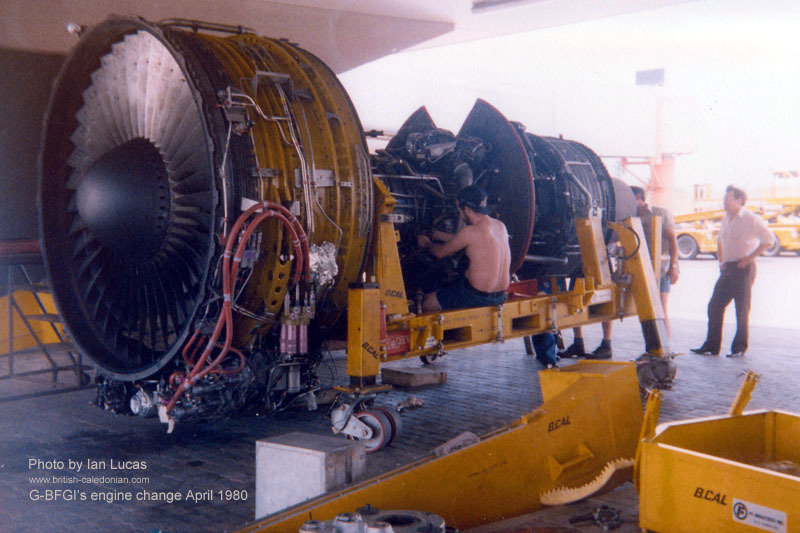 The first away from base DC10 engine change in April 1980. 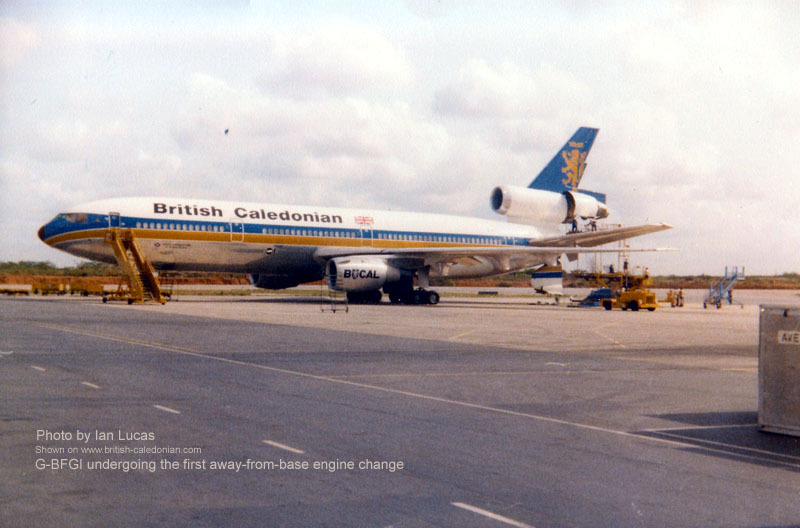 In March 1980 Alastair Pugh announced that during the three years BCAL had operated the DC10 there had never been an away from base engine failure. 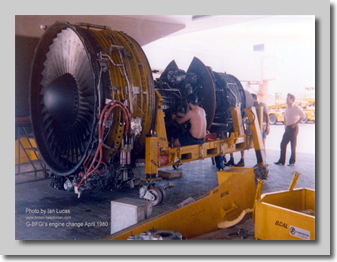 As far as I remember some thirty years on, these are the events of that engine change. 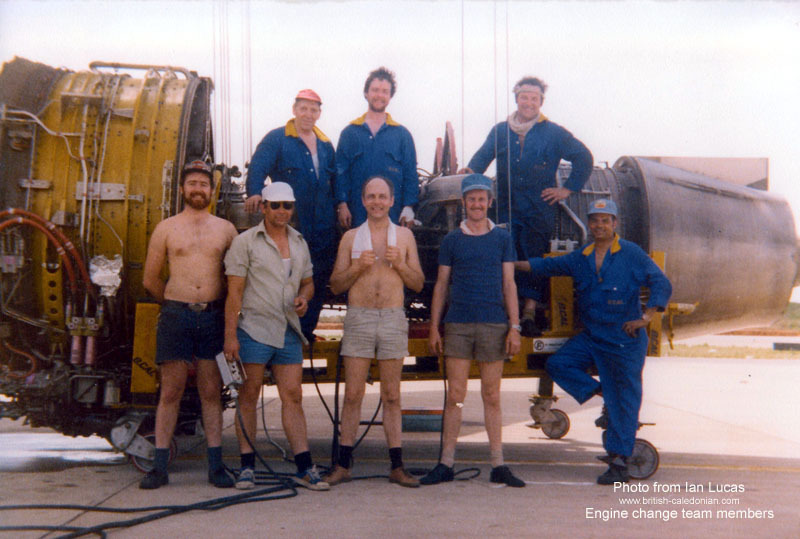 On the first or second Tuesday of that April news came in from Lagos - Nigeria that G-BEBL had had a turbine failure of the number two engine (this is the engine situated in the tail). I was part of the team who went out the next day to change the engine in Lagos. There were two teams - one from the hangar to remove the engine and another from the engine bay to assemble the spare engine. BCAL used the split and shift method. 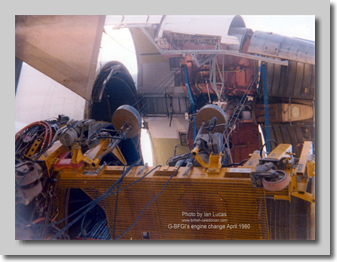 This consisted of the spare engine being separated at the fan assembly and the two parts of the engine then transported in two special stands. 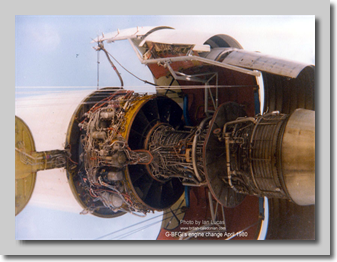 Doing this meant that the engine and associated equipment could be carried in the cargo hold of the DC10 or similar size aircraft. We all arrived in the evening of the Wednesday. Whilst the aircraft was unloaded we had to obtain entry visas. Taff Jones came with us as he had been station engineer at Lagos previously. He also realised that we would need to be supplied with food, water and drinks from the UK, and he arranged for the daily BCAL service to bring meals, drinks etc each day' The company ensured more than sufficient first class meals were Sent each day. This was our only main meal of the day, which took place around about 0100hrs each night. This meal was prepared using 'BL' galleys, mainly by the avionic guys as they tended to have more spare time than the rest of us, and very good it was. As soon as possible we set about preparing the engine for removal, using a very basic number two access stand which only had a vertical iron rung ladder. Which proved to be a bit of a challenge? As time went on the more tired we became the higher it seemed to get. Meanwhile, the engine bay team was putting the two halves of the spare engine together. 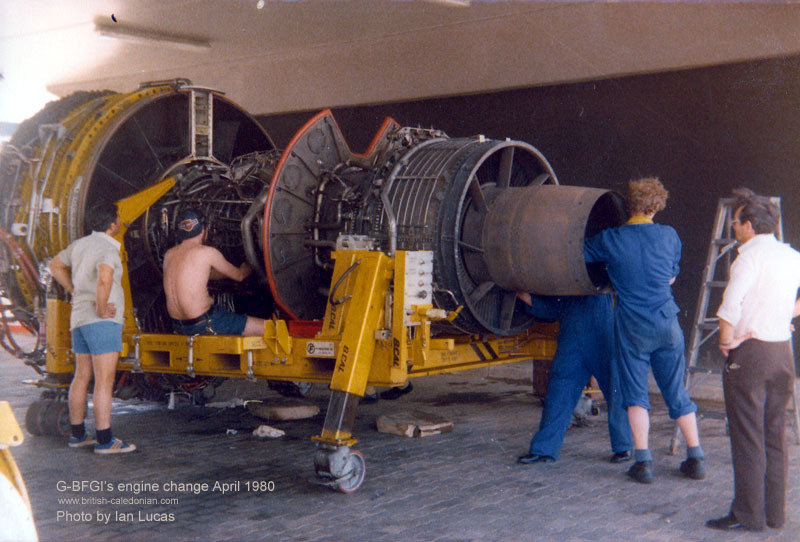 The now empty stand was needed to remove the old engine from the aircraft. 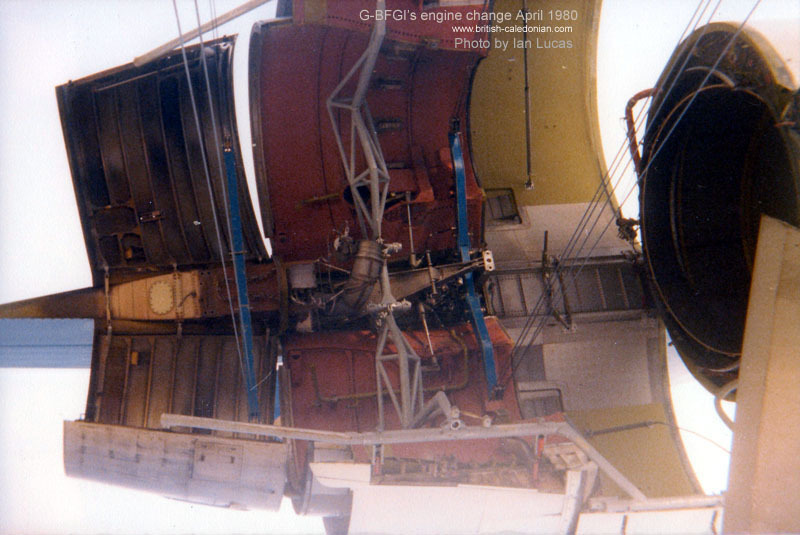 Because of its height from the ground, the engine was first lowered as normal using specially adapted electrical winches attached to the engine stand. 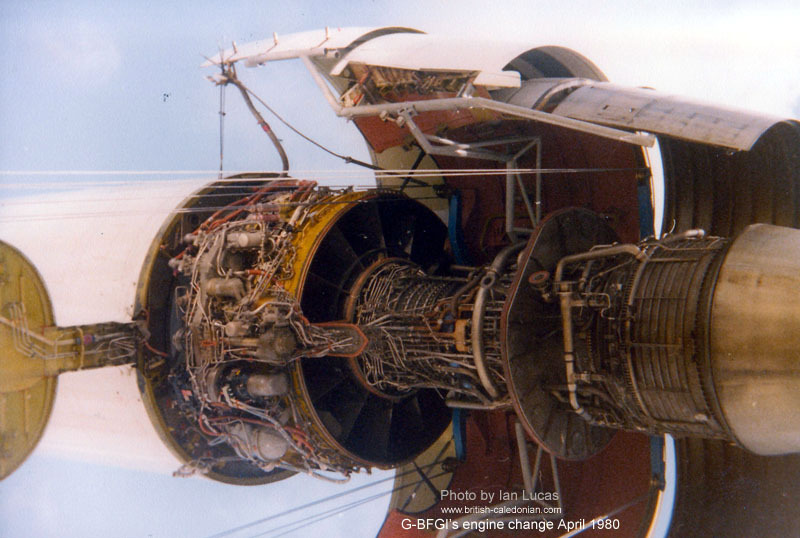 once the engine had been lowered sufficiently so as not to touch any of the aircraft, the access stand was removed, leaving the engine hanging some twenty odd feet above the ground. 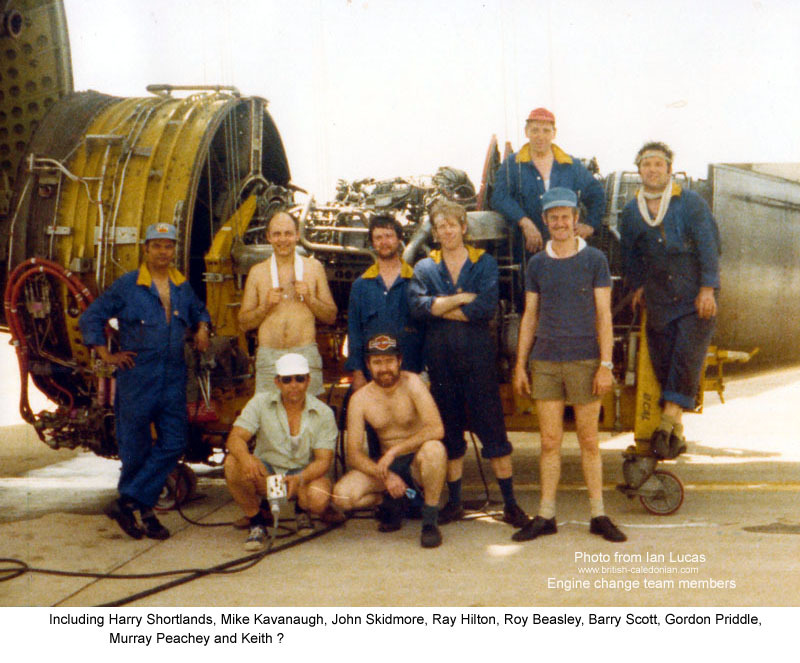 On the ground the winches were controlled by remote switches and the engine slowly but surely came down to the ground. We arrived at the hotel to find it had no electricity, and worse - no pumps to supply water to the rooms. We lay down on our beds just as we were; just four hours later we awoke and went back to finish the job, as dirty as we had arrived. We completed the installation of the engine, and carried out the ground runs. The engine bay team meanwhile prepared the old engine into the split and ship stands. We arrived back at Gatwick late on the Saturday evening, some three days earlier than had been expected. The following Thursday, G-BFGI decided to have another turbine failure. Again it was a number two engine. The exotic location this time was again sunny Lagos, therefore many of the original team headed back to Lagos six days after leaving it. 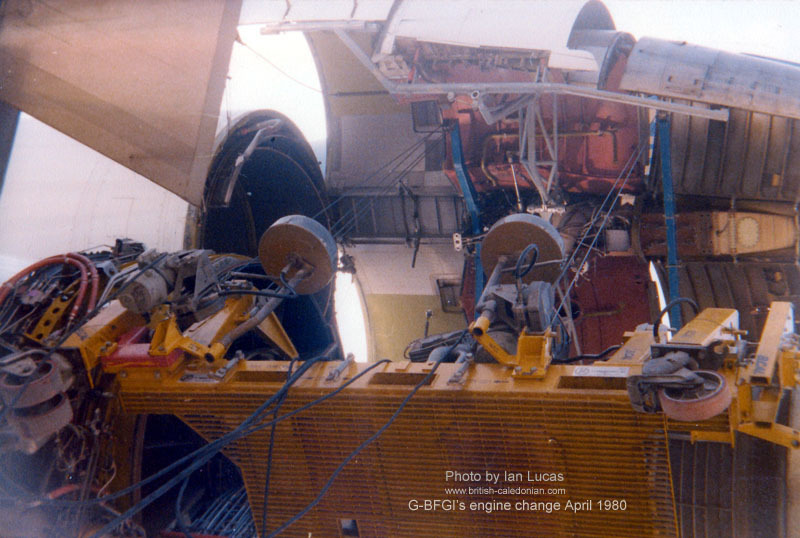 The pictures associated with this article were taken by me during 'Gl' engine change- This took a little longer as the engine bay had to prepare another engine for the split and ship before they could go. They arrived some twenty-four hours later. In July BEBL had a number one engine change, this time in Madrid. However, on this occasion we used Heavylift Belfast aircraft which was more than capable of carrying everything without the need to use the split and ship system. Three years without an engine change. Three engine changes in three months. They say things go in threes! 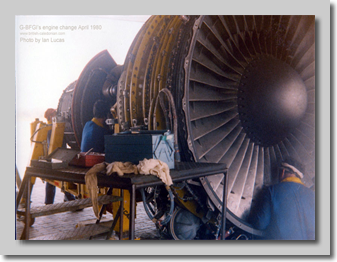 Ian's pictures of the engine change at Lagos certainly brought back memories as I was the engineer on duty when both engines blew up. Both engines failed very shortly after rotation and some people say they saw the shower of sparks that came out of the engine on the first failure. When the aircraft returned to stand I got a cherry picker and looked into the jet pipe and found a big mound of debris plus some bolts. It was very obvious there had been a major internal failure. 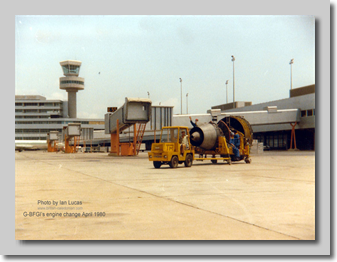 Its hard to believe but in those days there was no direct telephone link between Lagos airport and Gatwick. I had to use the aircraft radio to contact a link in Switzerland called Berner radio who then got a telephone link to Gatwick.Over this very bad connection I told Gatwick about the problem, as the CF6 had been so reliable and the fact I was so new on the job I had a bit of a job convincing Gatwick that I had a major failure. They asked if I would check and see if the fan would turn. So I got a normal ladder got on top of a catering truck (not inside but up of the roof) and got it to raise me up to the same level as the top of the fuselage. I pushed the ladder across and went onto the top of the aircraft. This was all taking place at night with a heavy dew so things were a bit slippery. When I got to the intake I found it was about chest high from the fuselage to the intake but I was able to jump in OK. I walked down and checked the fan which was free. The time now came to get out of the intake.When I sat on the edge and looked at the nice smooth wet surface I was going to land on I really did not like it. I fact I was very scared and I was thinking of how bad hospitals were in Nigeria if I fell off the top of the fuselage. After quite a long time I worked up enough courage and jumped out of the intake and spread eagled myself on the fuselage. I very carefully crawled back the catering truck. While we waited for the team to arrive from Gatwick I got things moving as best I could. 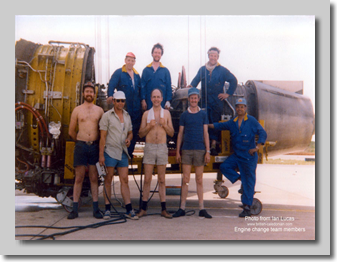 I got some big chest refrigerators into the engineers office and packed them with bottles of water and soft drinks as I knew the incoming team would go through a lot of fluid.The big break was that Lufthansa had a serving tower at Lagos specially designed to work on the centre engine and they agreed to lend it to us. You mounted it on a cargo loader and it could be adjust to the correct height. Without this piece of equipment it would have taken us days longer to change the engine. You can just about see it in one of the photographs. So I got that into position and open all the cowlings. When Taff got off the aircraft I asked him how he wanted to organise things and he said "Its your station Boyo you run the engine change and I will only step in if I see things going wrong".To his credit that is exactly what he did and he only came down to see the actual change a couple of times but I always knew he was monitoring things. 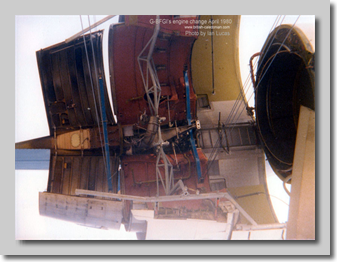 The first problem we had was that the step ladders the engine change team had brought with them would not fit between the engine cowlings and the engine. The team could not reach the top of the engine.The guys said they need normal ladders and when I worked out what they needed I took them over to the Nigerian Airways hangar and showed them some aluminum staging which was stacked in a corner which had some aluminum ladders to get to the various levels.I asked the guys if those were OK and when they said yes I told them to start taking the staging apart and to look like they had every right to do it with bags of confidence. I stood guard and when somebody from Nigerian Airways came over to ask what we were doing I asked him was he stupid as it was plain to see we were taking the staging apart.This satisfied him and everybody else in the hanger left us alone. Once we had two or three ladders it was off back to the aircraft. I learned this type of trick from Taff because if we had tried to go through the proper channels we would have got no where. 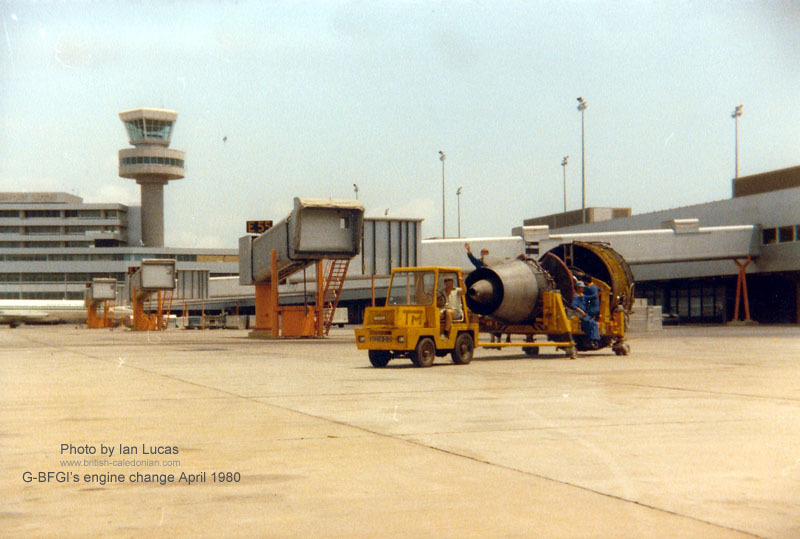 The engine build team were working in a drive through connector which was under the terminal and outside of the engineers office. This kept them out of the sun and there was a bit of a breeze and it was close the air conditioned office.As stated the engine came down in two halves and these had to be perfectly aligned before they could be fitted together.One of the stands had sprung a hydraulic leak and could not be raised into position so we were stuck.So once again it was over to Nigerian Airways where I bribed somebody with B-Cal first class give away bags to give me some of the correct hyd fluid. The team then asked for about 15 to 20 feet of clear plastic tube which they would use as a water level to line up the two parts of the engine.I could not have gotten them a piece of string that long let alone plastic tube at that time of night.In the end we got some garden hose with clear plastic pop bottles jammed in the ends to do the job. 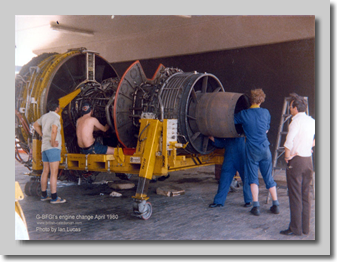 During the night we had both engines together outside of the office and they guys were transferring parts from one engine to another.I was only there to make sure that nobody needed anything and rather just sit in the office I decided to help change over the bits. So I got my tool box out and started to take bits off. Then next thing that happened was all hell broke loose. It turned out the one of the engineers was a very active union member and he got very upset I was using tools. He said Supervisors at Gatwick did not use tools and I went back at him with the fact it was not Gatwick but Lagos in the dead of night.For a time all work stopped and it looked like the engine would be blacked. 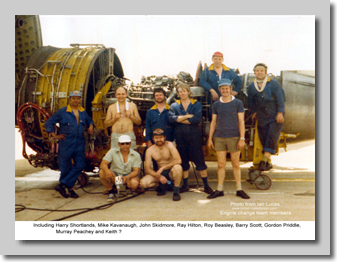 When things calmed down it was agreed that I would bolt the bits I had removed back onto the old engine and we would all pretend that I had never laid a tool on the engine. Once the engine change was complete the head office at Lagos wanted to pack the team back to Gatwick as quick as possible but I wanted to give the guys a bit of a holiday so made an excuse to keep them in Nigeria for an extra couple of days.One of the engineers had a very good set of tools in a very battered tool box. As we were packing up all the tool boxes were put on a cargo pallet with a cargo net over them. This pallet was in clear site and out in the open but when the time came to load the pallet the battered tool box was missing. It was not on the top of the pile so how the Nigerians stole it was a mystery. Back at Gatwick the engine bay had a fork lift truck which they should not have had.It had been declared scrap but the engine bay had some how kept it working.Scattered around the airfield at Lagos there were about a dozen fork lift trucks dumped in various ditches and hedges.When the guys saw this treasure trove of potential spares they were very excited. Well as I said you could be anything at Lagos in those days if you looked like you had a right to do it so a couple on the guys stayed on and took everything of the derelict trucks they thought they might need. 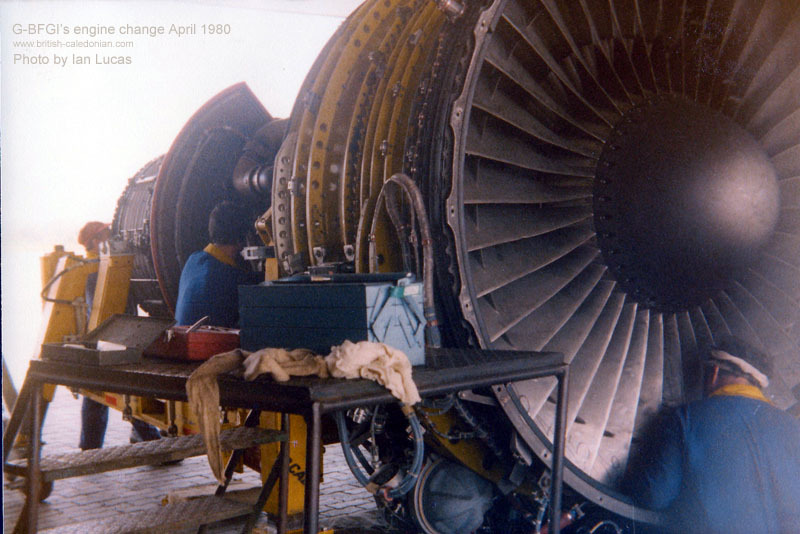 The second engine changed went a lot better because we had all learned from the first one. The ladders we had stolen from Nigerian Airways had gone back to Gatwick with the first team and came back down again as they were now part for the engine change tooling.